The Strib’s David Chanen says the Dakota County Attorney is reviewing possible charges against Minneapolis Police Chief Tim Dolan, but one is weird. Dolan apparently boarded his pooch at a police kennel for a week — a possible ethics violation. Dolan says others did it, too, but sounds contrite, and has since donated $200 to the city. Subordinates turned him in. Dolan is also being investigated for improperly disclosing employment information about a black officer now suing the city. The Strib’s Pat Doyle reports that a Warroad pastor is openly challenging IRS rules prohibiting political endorsements from the pulpit. The Rev. Gus Booth, a Republican National Convention delegate, has urged parishioners not to vote for Barack Obama or Hillary Rodham Clinton, then alerted church-state separation activists. The IRS says endorsements cancel a church’s nonprofit tax status, which is a privilege, not a right. It hasn’t begun investigating this case. Booth’s sermon is here (PDF). The Strib’s Dee DePass says Ford has called St. Paul union officials to Detroit for a Friday talk about their plant’s future. It’s part of a nationwide meeting in the face of high fuel prices. There’s some hope Ford might convert some truck plants to cars. No one knows if a big announcement — for good or ill — is imminent. Suddenly, the U is all smiles about Washington Avenue light-rail, according to the Strib’s Jim Foti. U Prez Robert Bruininks reports “enormous progress,” including who pays for mitigating traffic and building retrofitting. No details on how kumbaya was achieved, but Bruininks will recommend U regents approve the route today or Friday, which helps meet a September funding-application deadline. More LRT: the PiPress’s Dave Orrick says Minneapolis Mayor R.T. Rybak is bummed about “remarkably underwhelming” Central Corridor light-rail stations. The story features a neat visualization of driving down a reconfigured University Avenue — a zig-zaggy single traffic lane that made me think of bumper cars. KSTP says U.S. Transportation Secretary Mary Peters will be in town today for a “major funding announcement” on 35W congestion. The feds already awarded $133 million to the locals for things like bus rapid transit and high-occupancy vehicle lanes, so we’ll have to see if this is anything more than a grip-and-grin for Gov. Tim Pawlenty. The PiPress’s David Hanners slaps the outrage vein with a look at who still buys Hummers. Curiously, the first guy interviewed doesn’t want to give his name. That’s not very macho! The Pioneer Press reports that a former Liberian prison guard testified about a “savage and unceremonious” mass execution before a Truth and Reconciliation Commission hearing in St. Paul. The details make for tough reading. Minnesota has a large community of Liberian émigrés, which is why that country sent truth squadders here. A Lyon County judge has moved alleged bus-crash van driver Olga Franco’s trial to Willmar, the Strib’s Pam Louwagie reports. Franco is the undocumented worker accused of killing four teens and injuring many others. The PiPress’s John Brewer adds that the judge ruled media coverage was fair, and locals unbiased, but it would be hard to find someone untouched by the tragedy in the small, close-knit community. Via a neighborhood email list, Minnesota Independent’s Paul Schmelzer reports Minneapolis cops are criticizing a Fox9 report about a “home invasion” spree. There was a rash of burglaries, but no one was home, which is what you need for an invasion. Plus, suspects weren’t “on the loose”; they were caught in 90 minutes. Also, the burglaries didn’t happen solely in the Bryn Mawr neighborhood, as the station said. No response from Fox9, but the report is here. Not too far away, DFL state Rep. Willie Dominguez was robbed outside his north Minneapolis home, at gunpoint. First time in his 24 years there that’s ever happened, Dominguez tells the Strib’s Terry Collins. Ugh: Someone in a passing SUV fired on a Minneapolis biker … with a paintball. KSTP says Jael O’Hare was lucky to escape with only a tender ear. She got the license plate number, but the suspects are still at large. Cops think this might be the first such local attack. Realtors are happy that the huge home listings inventory has dropped for the first time since 2004, the Strib’s Jim Buchta reports.May inventory was below a year ago, indicating a balancing market. But the PiPress’s Jennifer Bjorhus notes May-to-May prices are still plummeting: down 13 percent in Ramsey County, 12 percent in Washington County and 11 percent in Anoka County. In the suddenly interesting world of grain prices, the PiPress’s Tom Webb says corn prices topped $7 a bushel for the first time. Bad weather hasn’t helped. The Strib’s Paul Levy says Vikings officials toured the Star Tribune site yesterday; one of four or five groups that have kicked the tires on the for-sale land. Publisher Chris Harte says, “We haven’t received an acceptable offer.” Curiously, I couldn’t find this story on the Strib’s website. 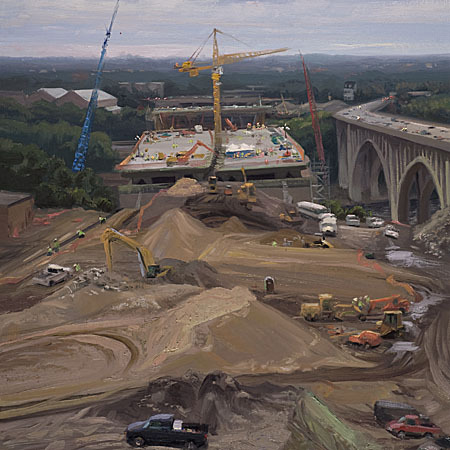 I’ll admit to being a friend of the subject, but MPR’s Euan Kerr offers a great report on painter Scott Anderson, who’s documenting the 35W Bridge rebuild in 90-minute portraits. The work is beautiful — click through for the slide show — a neat way to document vistas swallowed up each day by the galloping construction. Anderson, a “plein air” (open air) painter, battles 25 mph winds and the occasional yahoo. KARE has a nice, long look at Will Steger’s arctic adventure, which documented global warming. The Minnesota Daily has an engaging graphical look at University of Minnesota Athletic Director Joel Maturi’s tenure here. Budget stats, win percentage, grad rates — it’s a good package. Maturi’s name has been floated as Notre Dame’s a.d.
Nort spews: Twins win! The bats come alive as Minnesota tops Cleveland 8-5. Here’s the first Sore Loser in what feels like a month. The Cleveland Plain Dealer also profiles Joe Mauer.